If you happen to remember a time when video games came in audio tapes, the name 'Hewson Consultants' will surely ring an 8-bit bell. Exercise your memory a bit longer and you might even be familiar with Uridium, a 1986 scrolling shmup designed by Andrew Braybrook that sent both reviewers and gamers into a frenzy. After a successful Kickstarter campaign, Uridium’s spiritual reboot is finally within our grasp, but is there still a place for Hyper Sentinel 32 years later? There are 12 enemy Super-Dreadnoughts causing all sorts of havoc across the solar system and, sadly, the only thing standing between complete obliteration is your single Hyper Sentinel space fighter. That is all the plot you need for this one, think The Last Starfighter meets Star Wars' Star Destroyers in glorious 8-bit sprite-work. 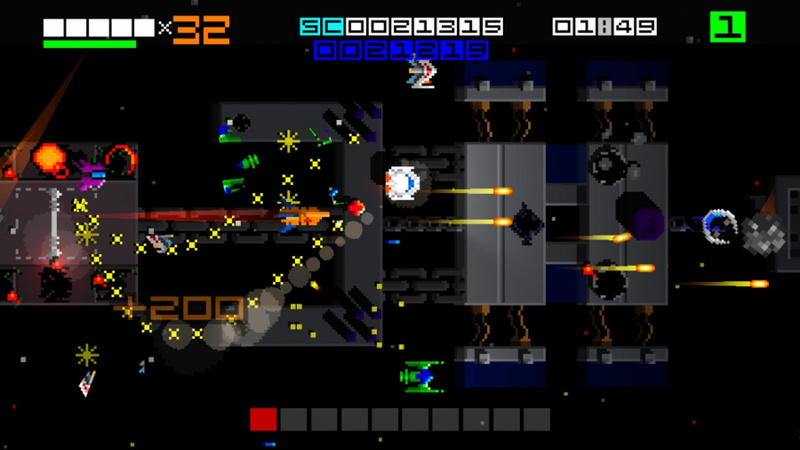 Gameplay is lifted straight from the original 1986 game and, as such, every level is viewed from a top-down perspective and stretch as long as the particular Super-Dreadnought you’re fighting against. You can move back and forth along said enemy metal monstrosity at your discretion. In fact, you will often need to do so in order to either attack all the surface targets needed to sniff out the enemy boss or just to evade pursuing enemy ships and ensure you live enough to actually make it to said boss. Its controls are nice and simple: the left analog or D-Pad control your ship in eight directions, 'A' or 'B' is your fire button and 'RZ' enables you boost to insanely fast speeds. 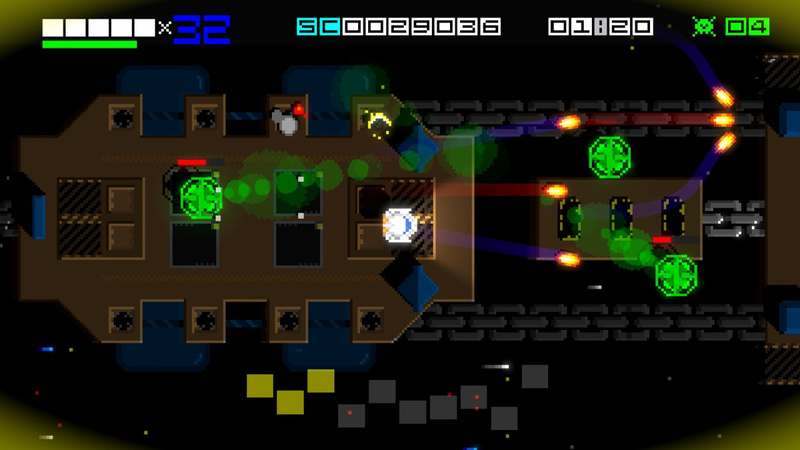 This boost can be used to either give chase to enemy ships and power-ups or simply evade danger from surface weapons or boss attacks. However, you can not fire and shoot at the same time, so despite the non-stop frantic shmup action you will need to keep a cool head and know when to boost. Each level is a score attack, so chaining kills to rack up combo multipliers is the best strategy to make your way up the online leaderboards. Despite the odds stacked against you, score boosters and special weapon pick-ups do help tip the scales in your favour. While your standard dual-firing lasers are more than adequate to take on anything the game throws your way, it certainly does no harm having a special (and sadly limited) weapon when facing up the Dreadnoughts many surface defences, ships and eventual bosses. There is even a very useful Smart Bomb pick up that clears the whole screen of baddies and gives you a much welcome brief respite form the onslaught. Keeping an eye out for these pickups is vital to succeed, but the action can get so frantic sometimes it's hard to keep up with everything going on screen. This is, however, not a minus point - on the contrary, it is part of what makes Hyper Sentinel... well, hyper. 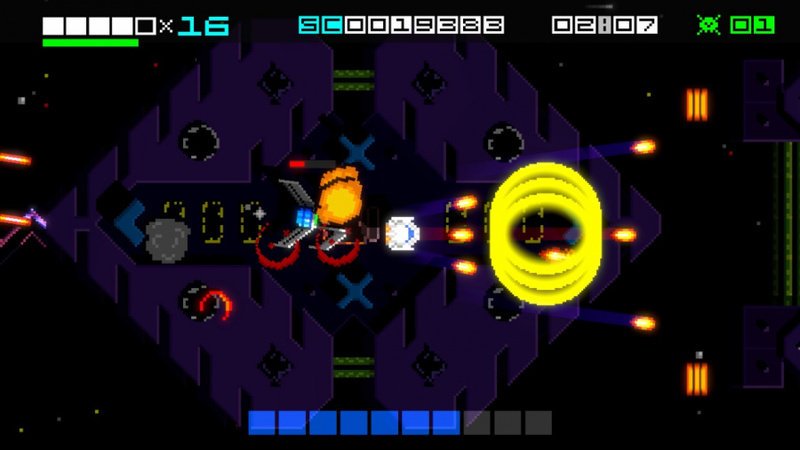 Once you have taken care of the ground targets of each Super Dreadnought, a unique boss will pop out and challenge you in its own way. You will need to change tactics and think of the best way to dispatch these efficiently, forcing you to discard the regular strafing run tactics in order to figure the best way to deal damage while not getting hit yourself. Your Sentinel shields do regenerate if you managed to stay away from enemy fire for a certain amount of time, but those seconds will always cost you multiplier bonuses. Finding the balance between 'fight or flight' will always keep you on your toes during these engagements. The aesthetics are true to the original, with graphics inspired by the 8-bit original instead of the 16-bit Commodore Amiga sequel. But don’t let that fool you into thinking this is a 'cheap' decision; the original Commodore 64 and the ZX Spectrum would melt if they ever tried to shift as much action on-screen happening at any point in the game, let alone successfully maintaining a constant 60 fps count while doing so. On the subject of those two outstanding home computers, the game has a few options to allow emulating a CRT effect and both ZX Spectrum and Commodore 64 graphics modes that will certainly bring an additional nostalgic tear to anyone who owned these machines in the past. The soundtrack complements the retro aesthetics with some over-the-top SID chiptunes by Fractures Music (aka Rob Fenn), the expected 8-bit sound effects and some digitised speech successfully manage to deepen the experience by immersing you further and reinforcing the faux-retro design of the whole package. Of course, that heavy reliance on nostalgia is always a double-edged sword. 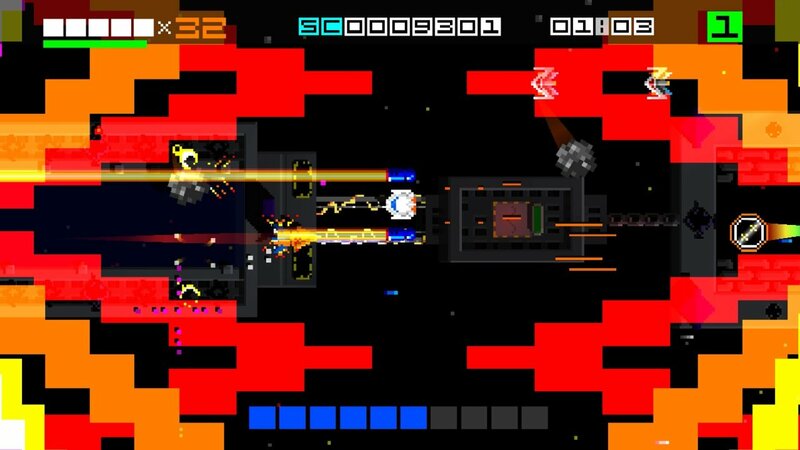 There is certainly a huge number of Switch owners who have never experienced Uridium before while others who did might be left wondering how can an 8-bit microcomputer game from 1986 possibly stand up to superior Japanese arcade offerings doing the rounds in Switch's library. Those are certainly valid points while pondering the investment on 'yet another shmup for Switch', but if there's something that none of the static pictures spread across our review can translate is how incredibly precise and addictive the whole gameplay portion of this package truly is. It was certainly fresh by 1986 standards and, amazingly, it retains all that made it special over three decades ago. The only real negative point we can find is the lack of multiplayer because this whole spectacle multiplied by another human-controlled Sentinel on-screen would certainly be something glorious to witness. Hyper Sentinel is 'neo-retro' executed to perfection. Once you accept that the visual and audio directions are both design choices made to pay tribute to the original Commodore 64 game and sit down to take on your first Super-Dreadnought, you’ll be hooked. Every time you get a 'Game Over', the only thing on your mind will be on how to prevent whatever got the best of you in preparation of your next sortie (while, at the same, time browsing the leaderboards to see how your friends are faring in each level). @Shiryu Awesome. Been waiting for this one Do the dreadnoughts have scenery to avoid like in Uridium. I watched a trailer and it looks like you can fly over everything despite some scenery casting large shadows. I don’t remember the original at all but this review tells me we have yet another shooter worthy of my money on the Switch! At this point, there should be an added tier to the Nintendo sub plan to have access to all the shmups your heart desires!! Yeah, I remember the way that the ship could turn on its side like that... it's all coming back! 😆 Not sure how I feel if these aspects are absent from HS. @Ooyah @GrailUK Yes, it is quite a respite form the original, there are no "towers" for you to crash into so you just need to worry on avoiding enemy firepower and ships. Also while doing research for this I discovered that Uridium actually made it to the NES, reskinned with TheLast Starfighter license. That sure brought back memories. And I am very happy that they delivered on their kickstarter promises and how well the finished product turned out. I just hope people don't overlook it because of how the game looks in still images. @Shiryu Gamers today have it too easy lol. @Shiryu 0:08 - 0:14 is probably the most savage attract sequence I have ever seen! I am in hysterics! @GrailUK It's a metaphor on the futility of war. @OfNullAndVoid Many POKEs saved me from hours of frustration on poorly constructed or sometimes just simply unfair games that otherwise I would never be able to see to the end. @Shiryu Mindscape: So the same sound channel that the music lives on is also shared with your shots? My problem with this game is how it is really hard to look at. Kids: MOM! Please buy my "The Last Starfigther" video game! "Each level is a score attack, so chaining kills to rack up combo multipliers is the best strategy to make your way up the online leaderboards." Now I just want to get my amstrad out and the old amstrad action cover tape fired up, free games on magazines them where the days. Andrew Braybrook was awesome in the 80s and his games were fantastic. 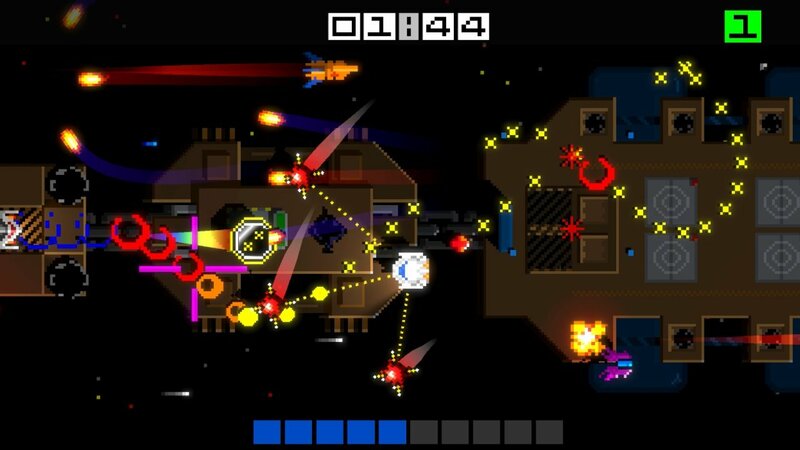 I actually preferred his previous game Paradroid (one of my favorite games of all time) as it had a slower paced more methodical approach, but Uridium was an all out shooter and one of the best around. 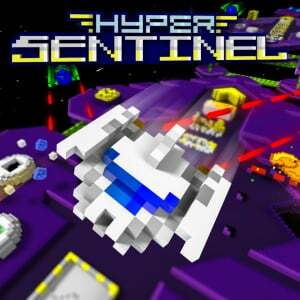 I didn't know that Hyper Sentinel was a spiritual successor to Uridium but now it's a must buy for me. @Shiryu Not actually the same game at all, the NES version is practically unplayable due to its ridiculous throttle controls and enemy speed movement. avoid at all costs. On my radar then. Approaching fast, as does payday! @YANDMAN Oh trust me, it is the same game. 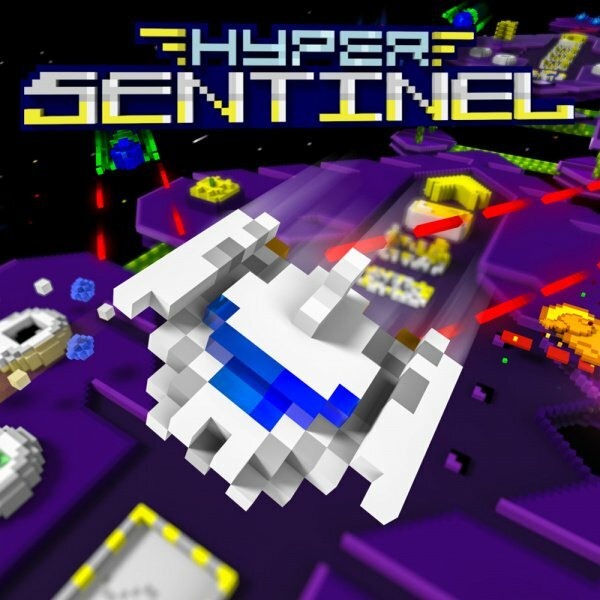 They just streamlined everything for Hyper Sentinel, making it far more pleasing experience for the current age. @Shiryu What i'm saying is The Last Star Fighter port is dreadful and unplayable. The original Uridium is fantastic. It's a poor port of a good game. Hyper sentinel fully restores what uridium was.